"In the Champions League Winner market Manchester United can now be backed at [13.0] having been matched at the huge price of [300.0] following their first leg defeat." 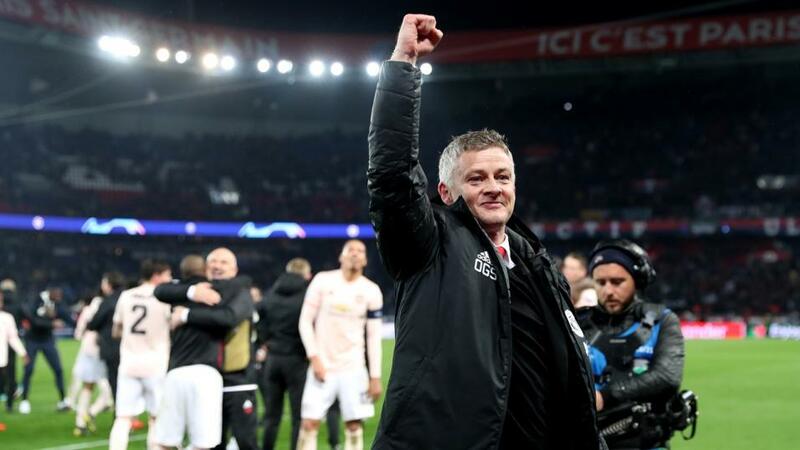 The Red Devils were given little chance of coming back from a 0-2 first leg defeat against one of the Champions League favourites, but Ole Gunnar Solskjaer's men once again demonstrated their new-found belief and togetherness since the interim boss took over. "Mountains are there to be climbed", declared Solskjaer in his pre-match press conference, not once bemoaning the fact that he would be facing the runaway Ligue 1 leaders away from home without a plethora of his injured first team players and his suspended star man Paul Pogba. Matched at a high of [36.0] in the To Qualify market United got off to the perfect start when Romelu Lukaku pounced on a defensive error to reduce the aggregate arrears inside two minutes. PSG looked dangerous going forward through the brilliant Kylian Mbappe, and it was the France wonderkid who fed a pass to Juan Bernat to restore PSG's two-goal aggregate lead just 10 minutes later. But back came United, and Lukaku was there again to capitalise on an error, this time veteran goalkeeper Gianluigi Buffon spilling a long-range effort which allowed the United striker to score his second goal of the night. The second half was more evenly-balanced, PSG having the majority of possession but not really creating any clear cut chances, while United always looked dangerous on the break but struggled to create any good opportunities of their own. So it was little surprise then that VAR technology had a huge say in the outcome on the tie, the video referee encouraging the on-field ref to take another look at Diogo Dalot's speculative shot that hit the arm of PSG defender Presnel Kimpembe. A penalty was controversially awarded, and up stepped Marcus Rashford to convert his first ever penalty for the club in emphatic fashion, United going through to the quarter finals on the away goal rule while also becoming the first team in Champions League history to overturn a 0-2 home defeat in the first leg of a knock-out tie. In the Champions League Winner market Manchester United can now be backed at [13.0] having been matched at the huge price of [300.0] following their first leg defeat. Despite leading 3-0 from the home leg Tottenham were fully expected to endure a difficult night on Tuesday when playing away to Borussia Dortmund. But some superb defending and a string of fine saves from Hugo Lloris kept the Bundesliga leaders at bay in the first half, and the tie was effectively over when Harry Kane scored with his first shot on target just after the interval. Spurs comfortably saw the game out, winning 4-0 on aggregate, and now trade at [15.0] to lift the trophy. Perhaps the most surprising result of the round so far was Ajax's stunning 4-1 victory away to Real Madrid, resulting in a 5-3 aggregate victory for the Dutch side and ending the Spanish outfit's three-year reign as European champions. Manchester City are the [3.7] favourites to win this season's Champions League, just ahead of Barcelona at [5.0], with Atletico Madrid and Liverpool next best at [9.0] and [11.0] respectively.